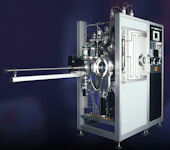 Leybold Vacuum USA manufacturers the UNIVEX line of universal experimentation PVD vacuum coating systems for use in research & development and pilot production applications. With an installed base of over 600 units, the UNIVEX has proven to be a highly successful and well known PVD deposition system throughout the thin film world. The UNIVEX is available in a wide range of chamber sizes and configurations including bell jars, stainless steel box chambers and multi-chamber cluster tools. UNIVEX is offered with many standard features and options including a choice of high vacuum pump systems, power supplies, PLC’s, a variety of substrate holders, film thickness and vacuum measurement, cooling & heating systems, feed-throughs, view windows and gas admission options. Various models of thermal and electron beam evaporators, DC and RF sputtering sources, organic evaporators and load-lock versions are also available to meet your needs. 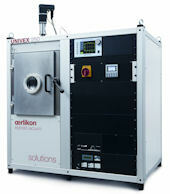 The application range UNIVEX covers includes vacuum thin film coating for research & development and pilot production for Passive Components, Solar Power and PV Research, Sensor Technology, Optoelectronics, LED’s, Semiconductor, Latent Finger Print Detection (VMD), Glove Box Integration, Thermal Conduction and Special Experiments. 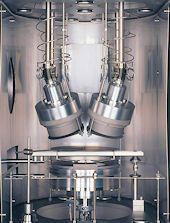 Leybold Vacuum - offers a broad range of advanced vacuum solutions for use in manufacturing and analytical processes, as well as for research purposes. The Segment's core capabilities center on the development of application- and customer-specific systems for the creation of vacuums and extraction of processing gases. Field of application is the semiconductor industry, thin films and data storage, analytical instruments and the classic industrial processes.